Seven explosions rocked Bombay’s commuter rail network during Tuesday evening’s rush hour. The blasts ripped apart train compartments and reportedly killed dozens, police and Indian media said. Though the chaos makes it difficult to ascertain exact numbers, how many have been injured, Indiant tv reports said that “the death toll could be in the dozens.” 40 80 100 105 137 163 172 200 people have died and 300 464 700 are injured. I’m sure that before I can even update this post, one of you will comment with the latest numbers; I sincerely hope that they are not high. I know, I’m excessively idealistic, but whenever I hear “Breaking News”, “Bombs” or “Trains” or similar, I screw my eyes shut and pray for miracles. Television images showed injured victims sprawled on train tracks, frantically dialing their cell phones. Some of the injured were being carried away from the crash site. The force of the blasts ripped doors and windows off carriages, and luggage and debris were strewn about. 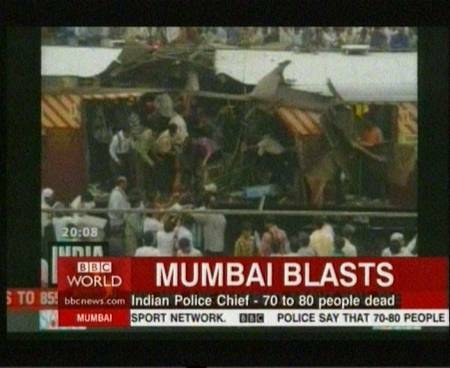 Pranay Prabhakar, the spokesman for the Western Railway, confirmed that seven blasts had taken place. He said all trains had been suspended, and he appealed to the public to stay away from the city’s train stations. Bombay, India’s financial center, and New Delhi, the capital, were reportedly on high alert. Bombay’s commuter rail network is among the most crowded in the world. The blasts appeared to have come in quick succession — a common tactic employed by Kashmiri militants that have repeatedly targeted India’s cities. The first explosion hit the train at a railway station in the northwestern suburb of Khar, said a police officer who spoke on the condition of anonymity because he was not authorized to talk to the media. India’s CNN-IBN television news, which had a reporter traveling on the train, said the blast took place in a first-class car as the train was moving, ripping through the compartment and killing more than a dozen people. …All of India’s major cities were reportedly on high alert following the attacks, which came hours after a series of grenade attacks by Islamic extremists killed eight people in the main city of India’s part of Kashmir. The image you see above is from Ultrabrown; his post on this horrific terrorist attack is here. CNBC’s reporter phones in to update the death toll: 100. The Mumbai Help blog has resources, updates and a very important reminder that blood donors are needed desperately. My prayers are with all who were lost, those who are injured, those who are fighting to literally pick up the pieces and help, those who cannot reach family and friends and everyone else who is affected by this craven, calculated attack. There is now a wiki for the event and instead of lashing out scornfully against India’s neighbor, please note that it was created by a Pakistani-American in California named Sabahat Ashraf (via ASATA’s mailing list). SAJA says he “helped lead similar resource (sic) during 2005 Kashmir earthquake”. SAJA’s contribution to blast-related resources–which includes a link to SM Alum Manish Vij’s Ultrabrown– is here. “Most of the patients have received burn injuries and are suffering from severe trauma,” M.E Yeolekar, head of Sion Hospital, told Reuters. “In my entire career as a physician, this is the second destruction I have seen of this magnitude,” he said, referring to bomb blasts in the western city in 1993 which killed 250 and wounded around 1,000 people. Hundreds of relatives frantically pored over a list of dead and injured outside the hospital, a scene repeated at many other hospitals, packed with people searching for friends and relatives. Some of the people who entered a makeshift morgue were unable to identify badly mutilated bodies. “I spoke to him 10 minutes before he died,” said Haji Mastan, sobbing uncontrollably over the death of his cousin Mukti Mahmood Darvesh, who was travelling on one of the suburban trains. In another hospital, staff constantly mopped up blood from the floor as patients were being wheeled in by the minute. “We collected scattered limbs with our own hands and put them in bundles and sent them to hospital,” said Santosh Patil, a railway labourer, as he stretchered in a mangled body. “It was a deafening sound and before anybody could realise anything the roof of the train was ripped apart,” said Mukund Thakur, who was travelling to the northern suburb of Andheri. Local people distributed food and water among hundreds of people who waited for news from their near and dear ones. “We are trying to persuade them to have something,” Gurpreet Singh Bangar told Reuters. An eyewitness at Mahim told the BBC some of those who had jumped from the train were run over by another train coming in the opposite direction. Others were lost in the stampede which was inevitable, considering all the panic. The Indian railway minister, Laloo Prasad Yadav, has announced financial help for the victims and their relatives. He said relatives of those killed will get 500,000 rupees ($11,000) each. He has promised jobs for the victims’ relatives and said the railways would also bear treatment costs for the injured. Washington, D.C.: As a former Bombay resident, I was pleasantly pleased at the way the city reacted to the bomb blast last time around. I hope the same sense will prevail this time as well — nothing defeats the terrorists more than gettting back to normal within hours of such an incident. Every resident of the city — former or current — walks wounded today. Suketu Mehta: Bombay is not going to be beaten down by these blasts. In 1993, the blasts killed 257 people; one of the buildings bombed was the Stock Exchange. The plotters were hoping to cripple the financial nerve center of the city. When the Stock Exchange reopened two days later, using the old manual trading system because the computers had been destroyed, it actually gained ten percent in the next two days. Just to show them. Mutineer Neha reminds me to check and then change the “tolls”. At this point, 900 people are either dead or injured (200/700). Have mercy. Following the serial bomb blasts in Mumbai yesterday, the Sensex opened marginally (nine points) lower at 10,605…Early nervousness saw the index slip to a low of 10,550. However, buying emerged at these levels and the index rebounded into the positive zone. Authorities say they do not know how many missing people there are. But Indian television stations are broadcasting pictures of dozens of missing in the hopes of helping relatives locate them. “I’ve been searching for hours. I don’t know where else to go,” he sighed. Because so many hospitals are treating victims, the search is difficult, Ahir says. Making matters worse, many with lesser wounds have been sent to the city’s many small clinics because the hospitals are overflowing. “What do I tell her when she calls again?” he asked. There are also victims without families. At a suburban hospital, a small boy lies unconscious, an oxygen mask strapped to his face. No one knows who he is. How many children are orphans now? If he wakes up, will this little boy even know where he’s from, what his parents’ names are, who he is? Heartbreaking. Gandhi, a college student, said her family had spread out to various city hospitals. “We’re taking his picture and showing it to anyone – to injured people, even to relatives of victims. Maybe someone will remember seeing him and we will find him,” she said. Gautam Chavan, is fearing the worst. Scenes of badly wounded people being brought to the hospitals upset him. “What if we can’t recognize him? What if he’s not recognizable? When will we know?” he cried. Via The Hindu: Pakistan’s Foreign Minister Khurshid Mehmood Kasuri makes tactless remarks, which rightfully get condemned by India (and me). External Affairs Ministry Spokesman Navtej Sarna said “no cause” could justify killing of innocent people…we find it appalling that Foreign Minister Kasuri should seek to link the blatant and inhuman act of terrorism against innocent men, women and children to so called lack of resolution of disputes between India and Pakistan”. Kasuri has said the “best way” of dealing with extremism in South Asia is to tackle “real issue” of Jammu and Kashmir. Right, because that justifies the slaughter of innocents. Noting that not much progress has been made on Kashmir problem, (Kasuri) said “incremental approach is good but now we must tackle real issues. And this is the best way of tackling extremism in South Asia”. Of course it is. Kill first, talk later. This entry was posted in News by A N N A. Bookmark the permalink. I am a Hindutvadi, but I would say please don’t ban Spoorlam, I actually do find him amusing, even though I am the target of the joke. Besides its not like any of the ostriches here are going to stop the coming war with their appeasing drivel. Enjoy the jokes. paging spoorlam. your services are needed. wow, this place is an ignorant, yet provocative mess. some of you need to get laid more often. Thanks for the link. I am a big fan of Dr. Morey and his brilliant analysis. Bob Morey’s vitriolic hate literature is an embarrasment to Christians everywhere. He has no training or background in comparative religions and has propounded some of the most absurd theses about the early history of Islam. He doesn’t have much love for Hindus either. I don’t know what the FBI is doing using him as a consultant. His writings on religion have not proven anything so far apart from the fact that he is an ignoramus! This thread has reached a suitably absurd point now that the bizarre theses of Dr. Morey and the leadership qualities of Smt. Sonia Gandhi have been tossed around, among other ravings. There will be plenty more talk about the aftermath of the Bombay tragedy, I’m afraid. Time to put this thread out of its misery. Night-night.